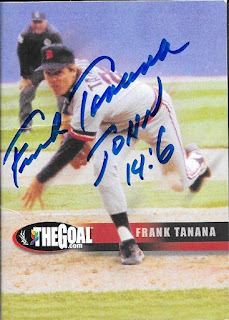 I was able to add a cool TTM success of a player who I remember had a lot of hype, but didn't really pan out that way. 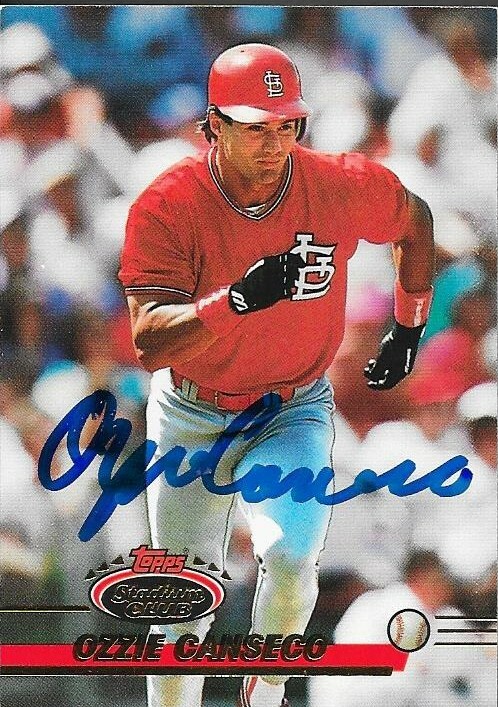 Ozzie Canseco, twin brother of Jose, came into the league with expectations that he would be a huge slugger. He didn't last too long in the league, but he still creates a bit of a novelty, as far as cards go. When I found out that he signs TTM, I had to send off a couple cards. Canseco (b. 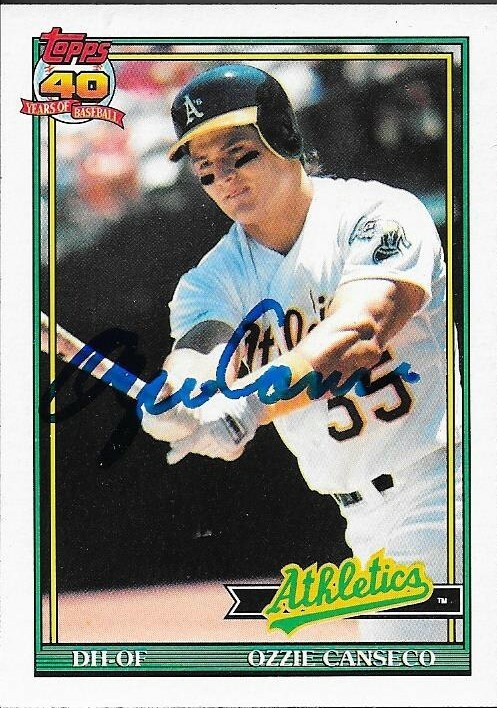 1964) played in the majors in 1990, 1992 and 1993 for the A's and Cardinals. He had 13 hits, no home runs (Jose hogged them all) and a .200 batting average. I mailed to Canseco on April 18 and got the cards back on May 5, for a 17-day TAT. I finally got a good deal on a quad relic of Orioles from 2016 Museum Collection. I got it for less than $20 and it is already in a magnetic case. 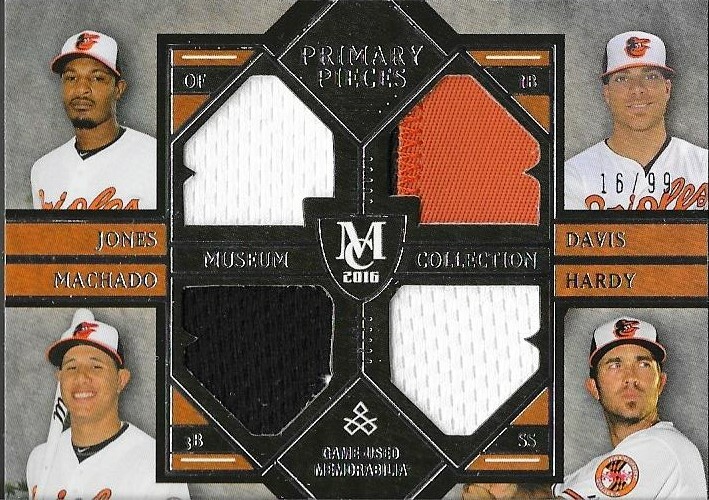 It features Jones, Davis, Hardy and Machado, with a patch from Davis. I now have Davis patches from 2014 to 2016 Museum Collection and I plan on adding some more, if I can get them as reasonable prices. 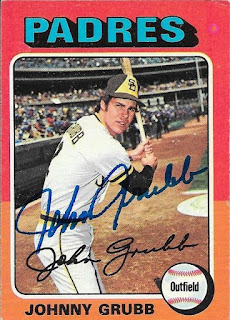 I received a nice TTM success recently from former big leaguer, Johnny Grubb. 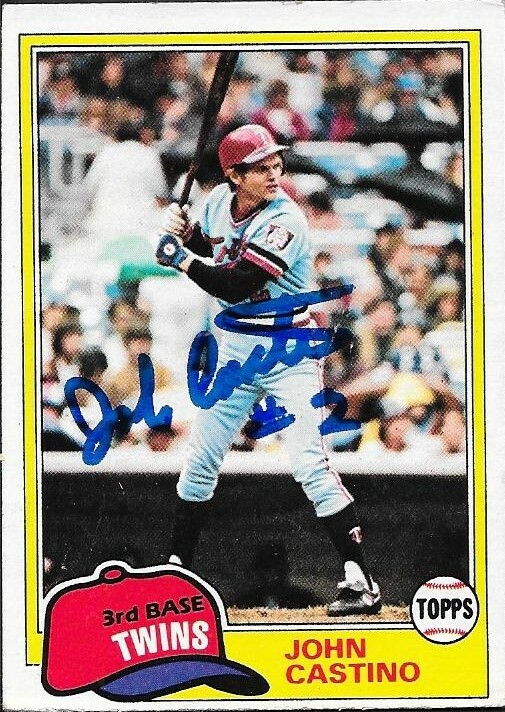 I was able to get some really ncie cards signed, starting with this 1975 Topps that I got from my good friend, Max. As of today, I have been able to get 13 of the 75s that Max gave me signed. Thirteen different ones, that is. I have doubled up on a few and sent them along to Max, since he was nice enough to provide me with the cards, and since he does some nice 50/50s for me as well. I was also able to put some of the cards I got from my mom to good use. These all came out of the 1980s boxes that she got for me, They all look great. Of these years, here are the totals I have so far as of today: 1985 - 19; 1986 - 15; 1987 - 19 and 1988 - 8. I noticed that 1985 has finally caught up with 1987 as far as most from one single Topps year that I have been able to get signed. 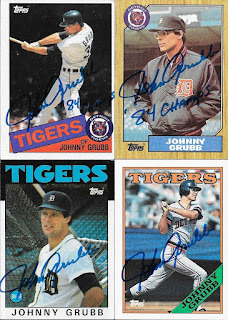 Grubb also inscribed the 1985 and 1987 Topps with '84 Champs. They all turned out great. Grubb (b. 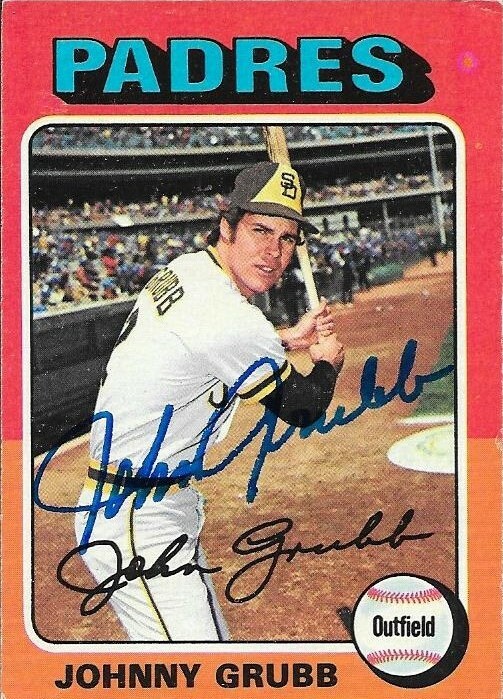 1948) played in the majors from 1972 to 1987 for the Padres, Indians, Rangers and Tigers. He had 1,153 hits, 99 home runs and a .278 batting average. He finished 6th in the NL Rookie of the Year voting in 1973 and was an All Star in 1974. He won the World Series in 1984 with the Tigers. I mailed to Grubb on April 12 and got the cards back on May 4, for an 18-day TAT. I don't collect football cards at all, but I thought it would be cool to try another football guy recently, but this time, it was one a little closer to home. Well, a lot closer to home. I thought it would be cool to try to get a couple cards signed from Ed Bradley, since I went to school with his daughter since the third grade. Bradley (b. 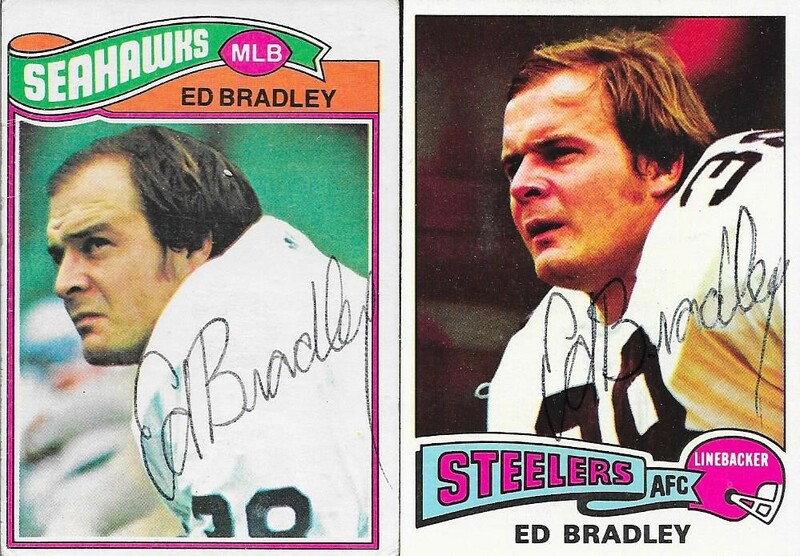 1950) played in the NFL from 1972 to 1978 for the Steelers, Seahawks and 49ers. He was a part of the Super Bowl IX and X champion Steelers. I got Bradley's address from his daughter, Jennifer, who I have known since the third grade, and graduated with. Class of 1998!! I mailed to Bradley on April 20 and got the signed cards back on May 4, for a 14-day TAT. I also got a nice note from Mr. Bradley, which was a nice touch! Thanks for the help with the TTM request, Jennifer! 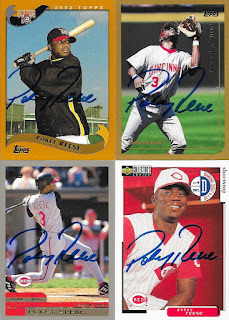 I got some more cards signed that had been picked up from the Columbia antique shop. 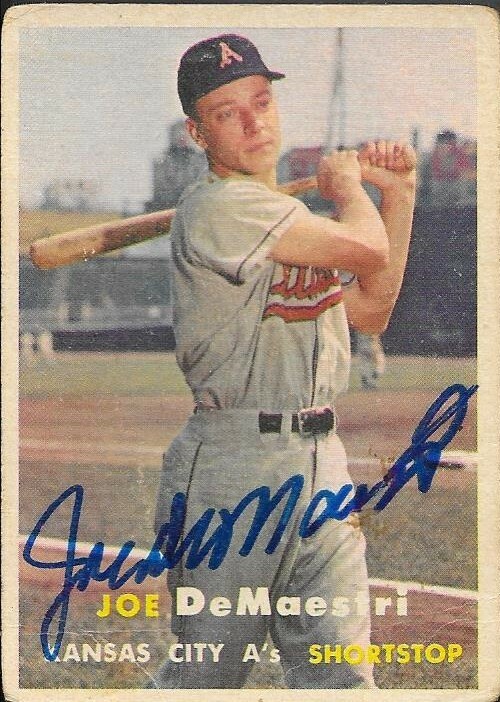 I got this awesome 1952 Topps, and the signature turned out great. All of the 1952s that I got have all turned out really well. I'm glad, since I paid a premium to pick them up! This 1955 also turned out nicely. The real signature is the one across his shoulder. 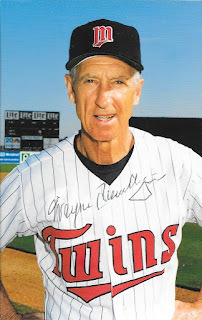 He also included this signed post card from when he was a coach with the Twins. This was a nice addition from Mr. Terwilliger. 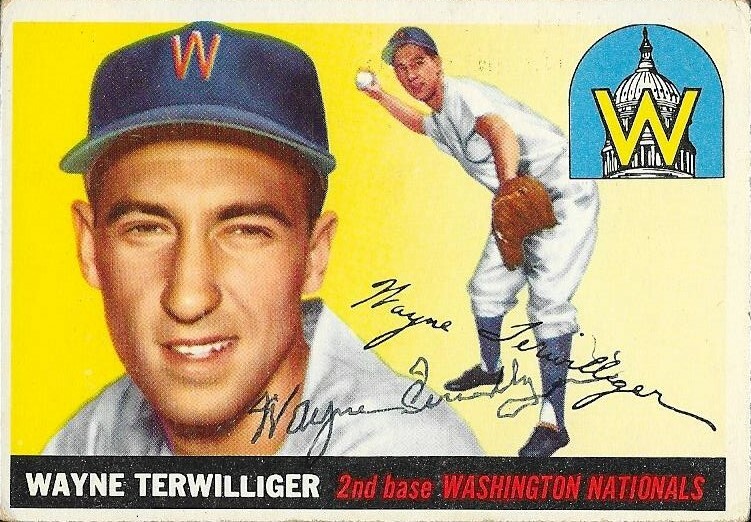 Wayne Terwilliger (b. 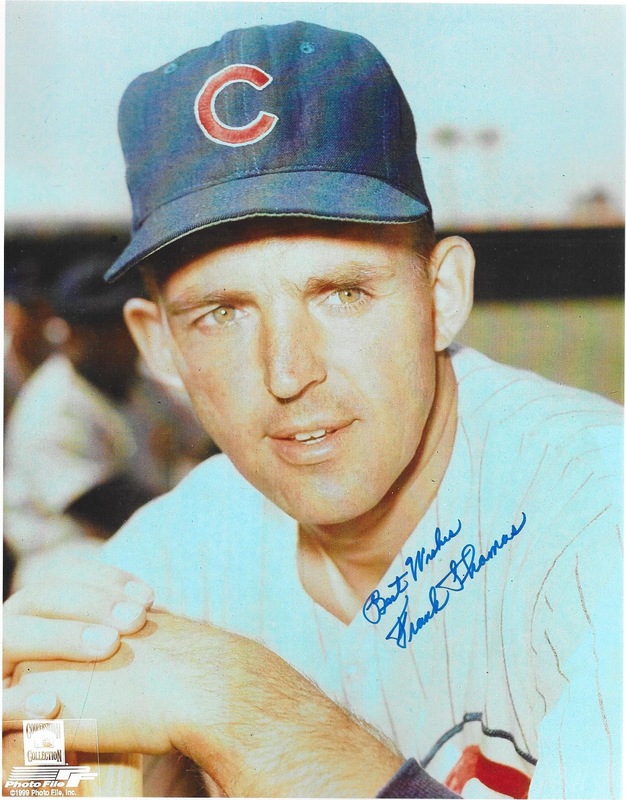 1925) played in the majors from 1949 to 1951, 1953 to 1956 and 1959-60 for the Cubs, Dodgers, Senators, Giants and A's. He had 501 hits, 22 home runs and a .240 batting average. He played so long ago, four of the five teams he played for are in new cities! I thought that was interesting. 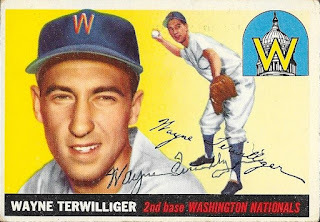 I mailed to Terwilliger on April 23 and got the cards back on May 3, for a 10-day TAT. I have found a TTM signer who might be as prolific as the late Virgil Trucks. 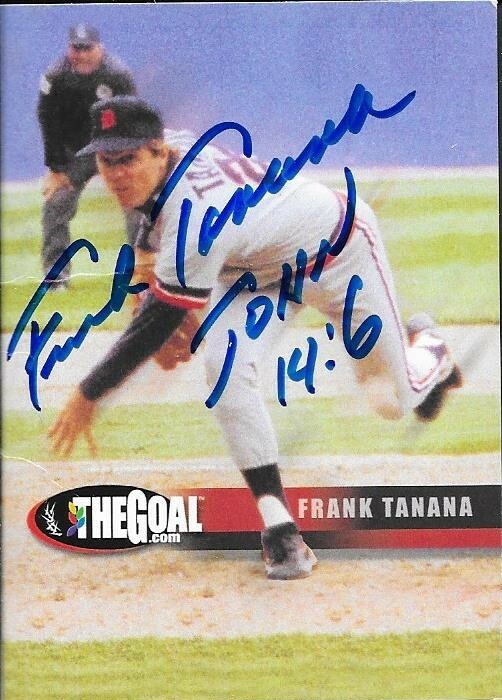 I sent the above baseball card and $5.00 to Frank Thomas (no, the other one) and got it back signed. 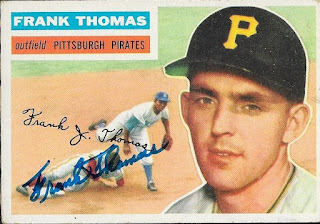 The signed 1956 Topps wasn't the end of the process, however, because Mr. Thomas also included the below card of his own (also signed) and a lengthy note. Mr. Thomas's note discussed some of his career accomplishments and explained that he had some photos for sale for a nominal fee that would also come signed. 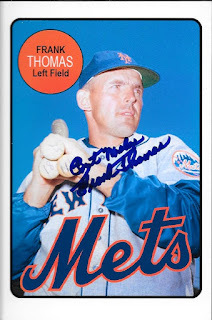 Since Mr. Thomas took the time to write me the full letter, I wrote him back thanking him for signing my card and expressing interest in his order form for the signed photos. He sent me another lengthy letter back, along with his photo order form, so I decided to buy several of the photos he offered. I made the purchase because he uses the money to support a children's charity, and also because he was so nice to write me full length letters and signed my items. I was very pleased with how the photos turned out. I ordered smaller copies of a few, like the Mets one shown above. I also wanted some 8x10s for my wall, so I ordered the above Cubs photo and the below Astros photo so I can frame them and put them beside some of the other 8x10s that I have. Virgil Trucks was a great friend of mine. After my playing days were over, he got me involved in going on cruises. If he couldn't make the one he was supposed to be on, he would call me and ask me to pitch in for him. One great man. Yes, he was like me, William, in answering his mail, which a lot of players didn't do. Frank Thomas (b. 1929) played in the majors from 1951 to 1966 for the Pirates, Reds, Cubs, Braves, Mets, Phillies and Astros. He had 1,671 hits, 286 home runs and a .266 batting average. He finished 4th in the 1958 NL MVP voting and was a 3-time All Star. He never played in the playoffs or World Series and oddly enough, even with his career accomplishments, didn't appear on the Hall of Fame ballot. I originally mailed to Mr. Thomas on April 18 and got the cards back on May 2, for a 14-day TAT. I sent off for the photos on May 20 and got those back today (May 26) for a 6-day TAT. Mr. Thomas is also offering signed 8x10s that I still intend to purchase. One of which shows all of his baseball cards and the other shows him and three other Braves players who made history on June 18, 1961. He, along with Eddie Mathews, Hank Aaron and Joe Adcock hit 4 home runs in succession against the Reds. A pretty huge feat in the annals of baseball history. I want to spend the $20 on that one real soon. 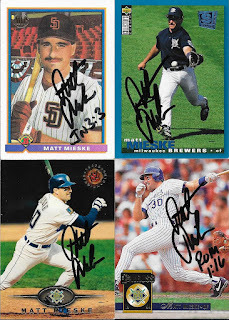 I was able to add some 1990s cards via TTM when I got these back from Matt Mieske. This 1995 Topps was the first that I was able to add from that set. This is a really nice one, with it being horizontal, and the cloudy sky in the background. It really turned out great. Here are some other 90s staples that I was able to get signed. Clockwise from top left are: 1991 Bowman RC, 1995 Collectors Choice SE (I always loved this set), 1994 Donruss and 1995 Stadium Club. Mieske (b. 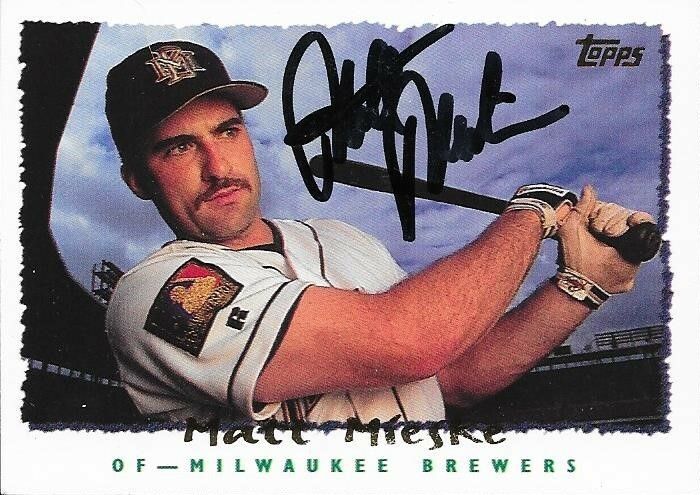 1968) played in the majors from 1993 to 2000 for the Brewers, Cubs, Mariners, Astros and Diamondbacks. He had 406 hits, 56 home runs and a .262 batting average. I mailed to Mieske on April 21 and got the cards back on May 2, for an 11-day TAT. 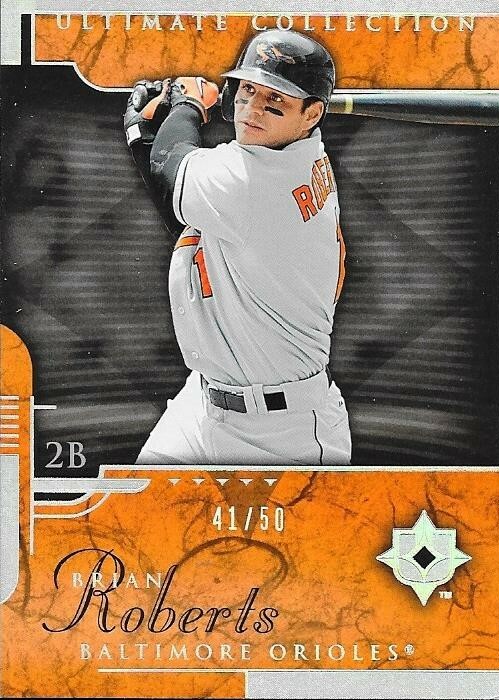 I picked up my first Trey Mancini auto off of Ebay a couple weeks ago. 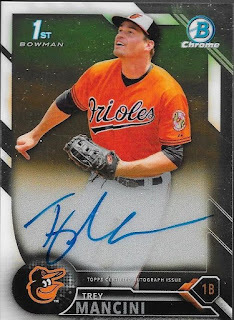 I knew I wanted one once 2016 Bowman came out. Mancini was the Orioles minor league player of the year last year after hitting .341 between High A Frederick and AA Bowie. 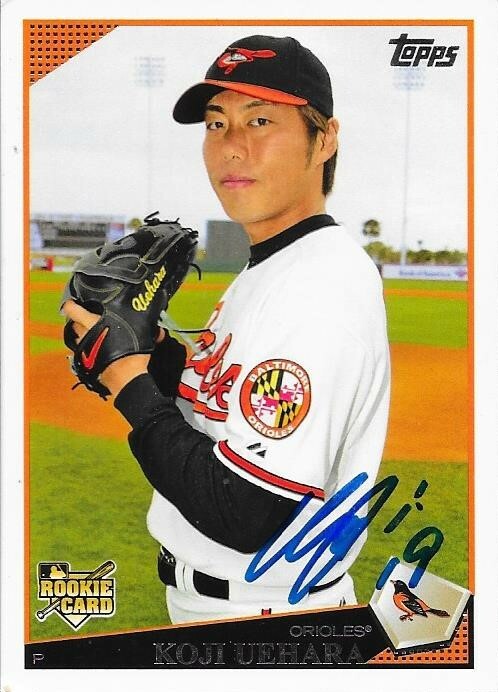 He helped Bowie win the Eastern League Championship last season. He started the season in AA this year as well, but was moved up to AAA Norfolk after 17 games. He is currently batting .241 with 3 home runs at Norfolk. Keep in mind, Harbor Park is tough on hitters, so Mancini's lower average should not set off any alarms. I was also able to save on shipping on this card as well, since the seller I bought it from lives in the same town as me, and frequents the same LCS. That worked out great! 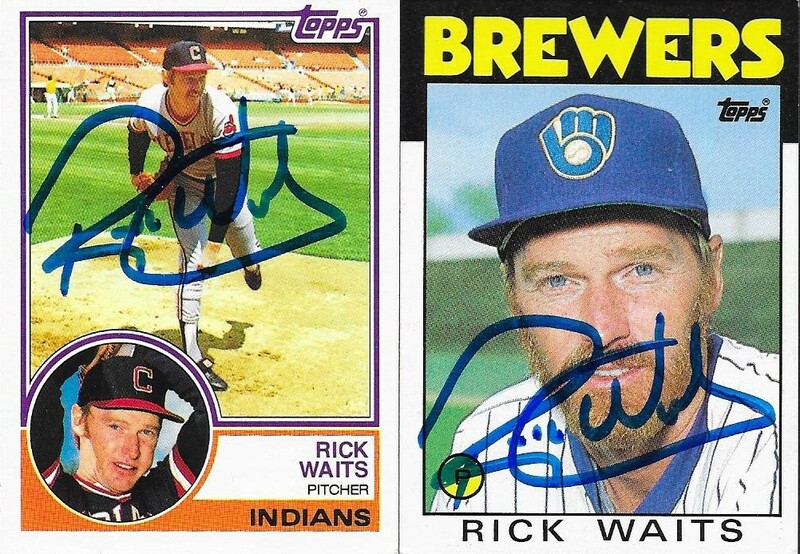 Here are some nice 1980s cards that I got back TTM from former pitcher, Rick Waits. I was able to add a few more tick marks beside 1981, 1982, 1983 and 1986 Topps. They all turned out really nice, I think! Waits (b. 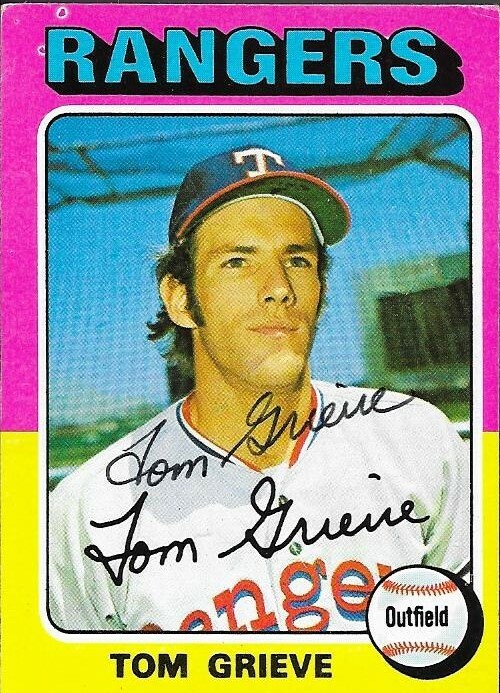 1952) played in the majors from 1973 and 1975 to 1985 for the Rangers, Indians and Brewers. He had a record of 79-92 with an ERA of 4.25 and 659 strike outs. I mailed to Waits on April 18 and got the cards back on May 2 for a 14-day TAT. 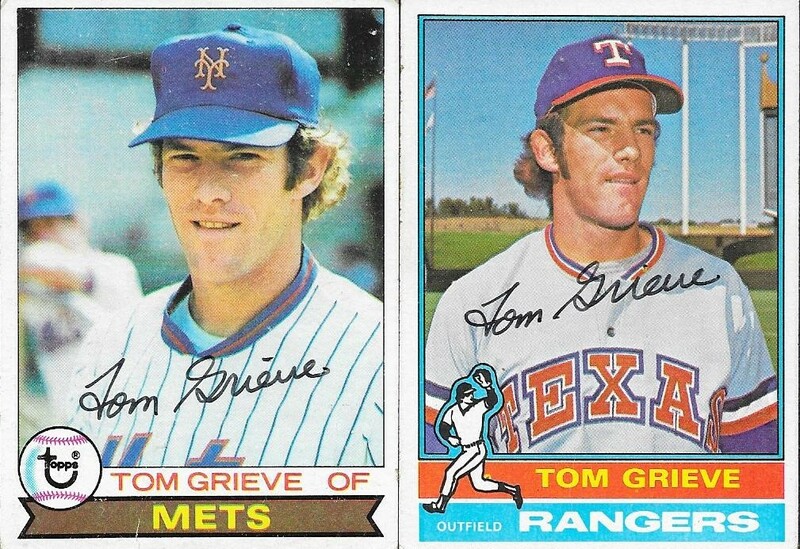 I added a TTM success of Tom Grieve recently on a few nice mid-70s cards. 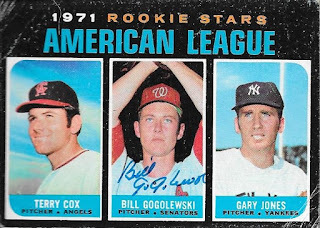 This 1975 Topps card that Max gave me turned out really nice. The card was in great shape as well. 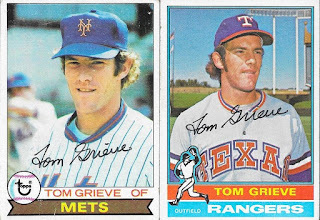 The 1979 Topps of Grieve on the Mets has probably the nicest signature of the trio, but the 1976 has probably the best looking uniform. I got these two cards from the Columbia antique shop. I need to take some time to go back through those cards and prepare another round of TTM subjects. Grieve (b. 1948) played in the majors from 1970 and 1972 to 1979 for the Senators, Rangers, Mets and Cardinals. He had 474 hits, 65 home runs and a .249 batting average. After his playing career was over, Grieve was the general manager of the Rangers from 1984 to 1994. He has also done color commentary for the Rangers since 1995. I mailed to Grieve on April 20 and got the cards back on May 2, for a 12-day TAT. I got a DM on Instagram a few weeks ago from a guy who was looking for some 1988 Fleer cards so that he could do some TTMs. It just so happened that I had a broken set of them, so I was able to find every card that he needed. I didn't think much of it, since the box was just taking up space, but the guy (Billy R.) insisted that he send me something in return for the cards I sent him. 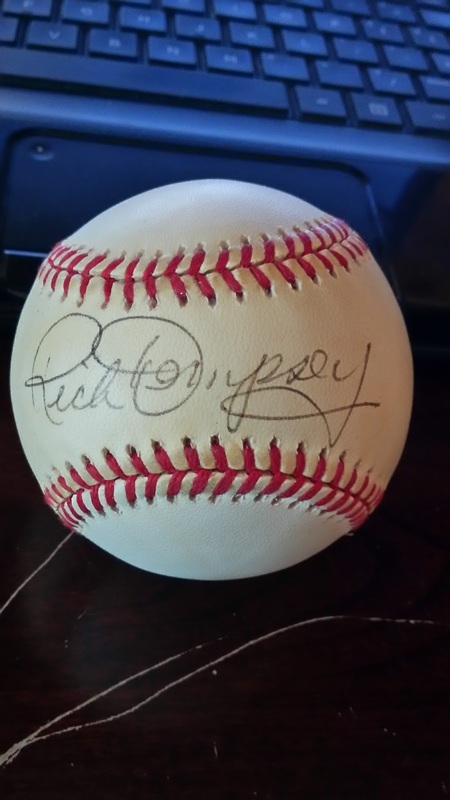 A few weeks later, a box came from Billy and inside it was this signed baseball. 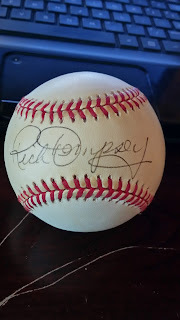 I have been needing a Rick Dempsey baseball for some time now, and didn't have to do a whole lot to get it, apparently. Billy also included a card that he wanted me to send out TTM (Paul Noce), so I need to get on that, once I find a couple more of his cards. Dempsey (b. 1949) played in the majors from 1969 to 1992 for the Twins, Yankees, Orioles, Indians, Dodgers and Brewers. He had 1,093 hits, 96 home runs and a ,233 batting average. He won the World Series with the Orioles in 1983 and the Dodgers in 1988. He was the 1983 World Series MVP. He is also one of the rare 4-decade players, having played in the 60s, 70s, 80s and 90s. Dempsey appeared on the Hall of Fame ballot in 1998 and received 0.2% of the vote. 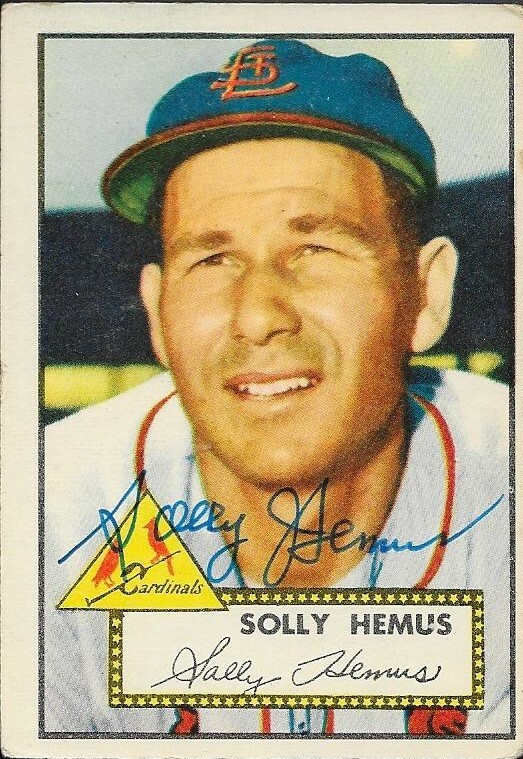 Some more signed cards that I picked up in Columbia came in when I got three from Solly Hemus. I had picked up a 1952 Topps that looked really nice. I now have 7 signed cards from that set, and they all look great. 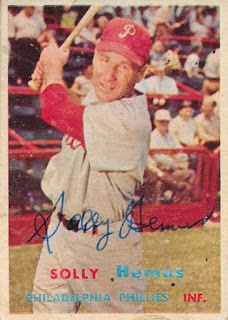 1954 Topps always looks nice, and Mr. Hemus's signature does, in fact, resemble the faux signature that was printed on the card. Finally, here is a really colorful 1957 Topps. 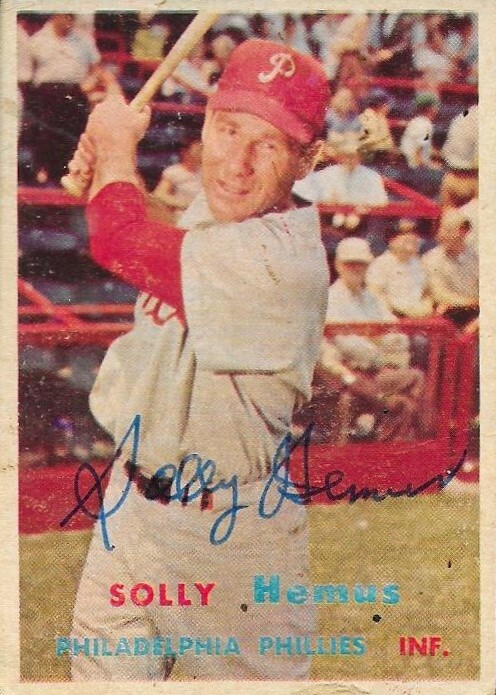 All of the red in the background of the card makes Hemus kind of blend in and a little difficult to see. Regardless, it is still a pretty cool card! Hemus (b. 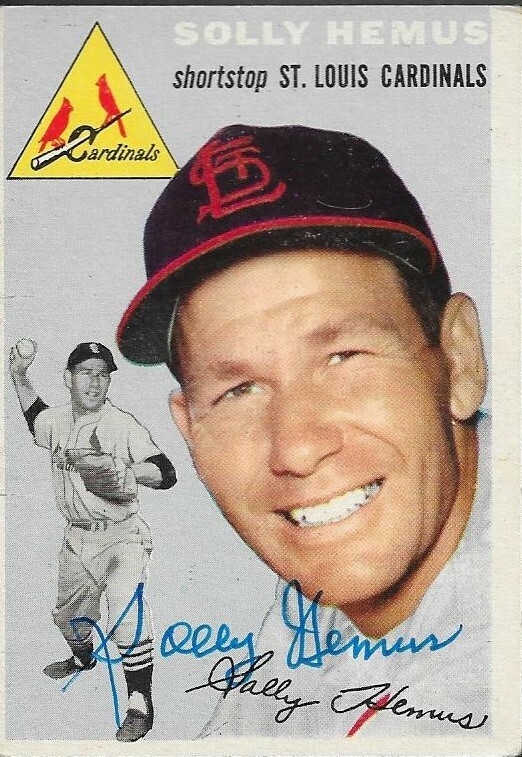 1923) played in the majors from 1949 to 1959 for the Cardinals, and Phillies. He had 736 hits, 51 home runs and an average of .273. He finished 31st in the NL MVP voting in 1952, the only time he received votes for the award. Hemus also appeared on the 1966 Hall of Fame ballot and received 0.3% of the vote. I mailed to him on April 18 and got the cards back on May 2 for a 14-day TAT. I had to continue a now annual tradition in picking up some Museum Collection of Chris Davis. 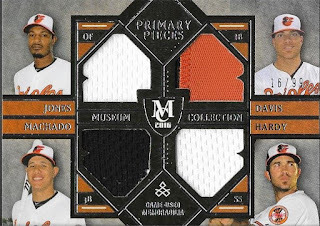 I have yet to see as many amazing patches as I saw when 2014 Museum Collection was released. 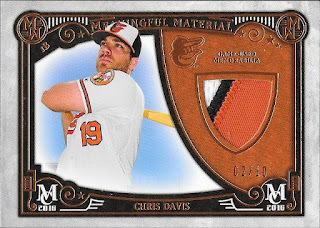 However, I still enjoy picking up some of the product and adding it to my Davis PC. I have a bunch of Davis patches from 2014 to 2016 Museum collection, all in magnetic cases, wrapped in team bags. This one is numbered 2/10 and didn't cost me a whole lot. I got in on an auction and was able to snag it a lot cheaper than any Buy it Now that I have seen. Davis has been hitting a few home runs lately, and is known to get hot and go on a tear. I'm hoping he hits another 40+ homers this year and continues the hitting he has done from 2013 and 2015. I was able to add this nice 1981 Topps Steve Nicosia auto when I received a TTM from him on May 2. 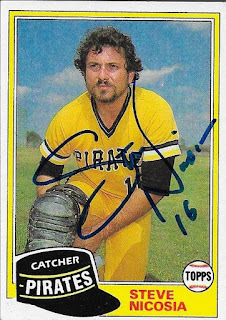 I really liked the bright yellow uniform that Nicosia was wearing for this card. Paired with the bright yellow border, this is a really vivid card. I sent three cards to Nicosia for signature, but he kept two of them. I feel like I got the bast card back, though. Nicosia (b. 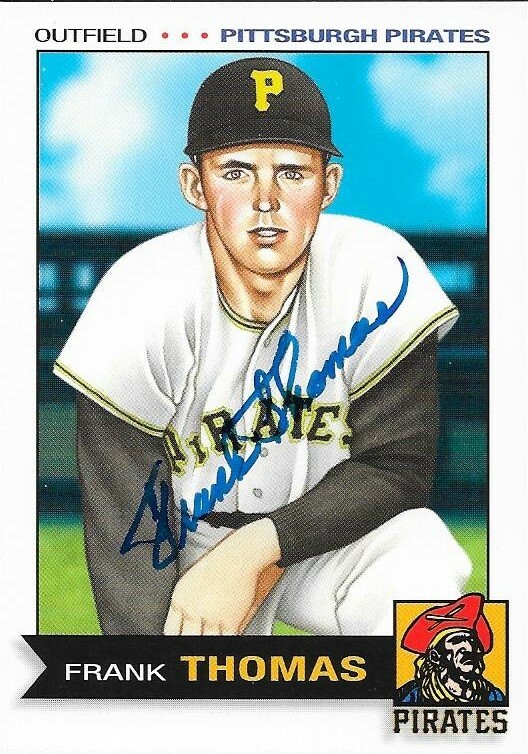 1955) played in the majors from 1978 to 1985 for the Pirates, Giants, Expos and Blue Jays. He collected 233 hits, 11 home runs and an average of .248. 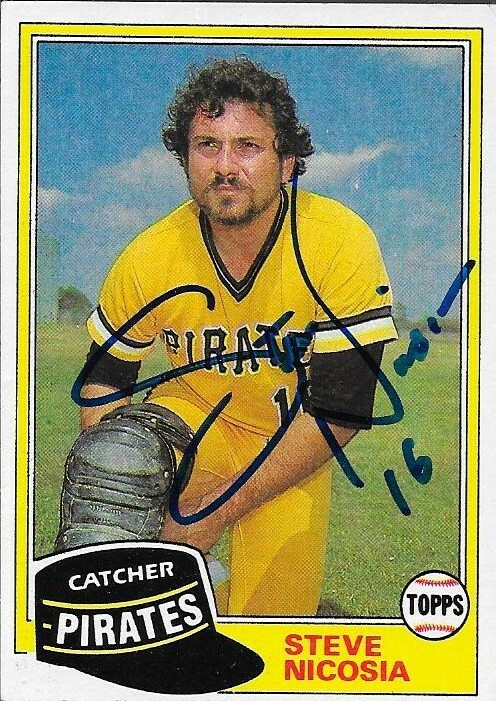 He won the World Series in 1979 with the Pirates. I mailed to Nicosia on April 20 and got the card back on May 2, for a 12-day TAT. I added some more tick marks beside 1953 and 1954 Topps when I received these from former big leaguer, Jim Greengrass. 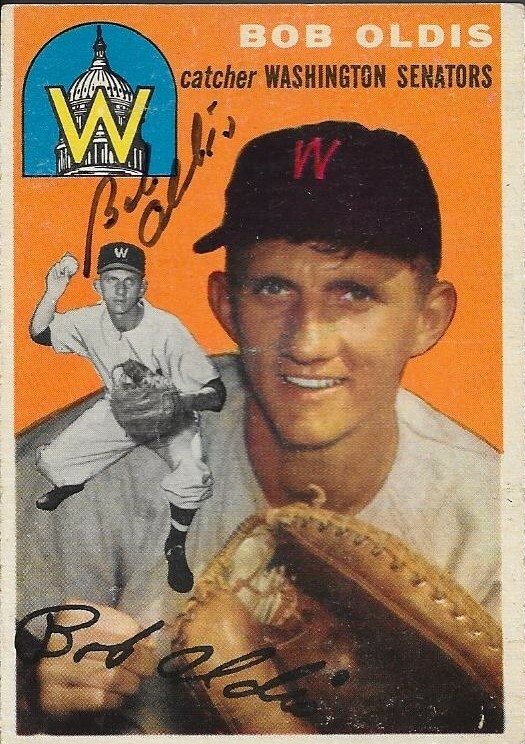 His signature turned out pretty great on this 1953 Topps. 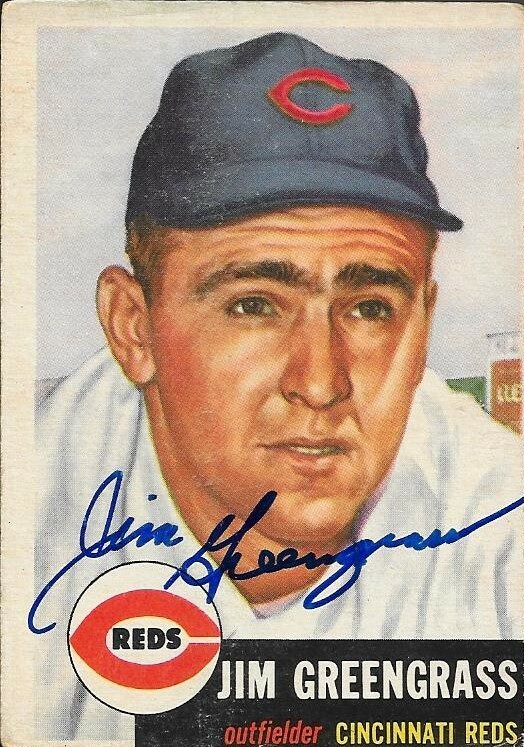 This 1954 also turned out pretty well, but Greengrass didn't seem to want to sign across the top of the card. Instead, he kind of dodged his hat. 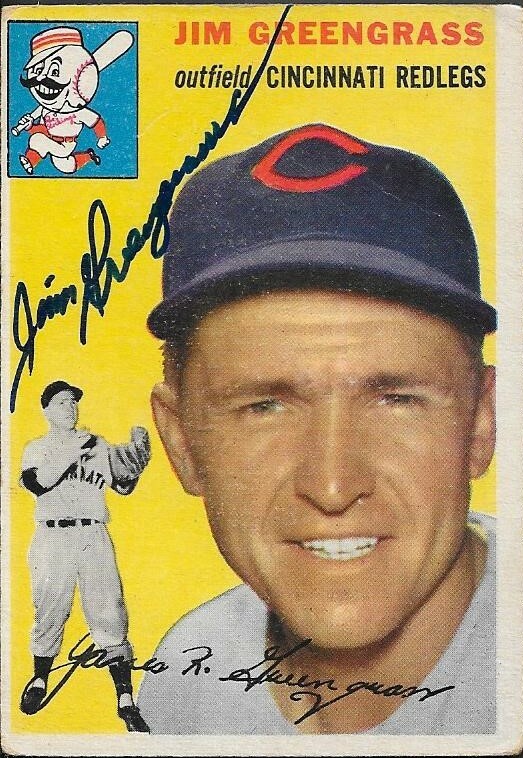 I like the old Reds logo on this card, and also the McCarthy-era change to Redlegs. Greengrass (b. 1927) played in the majors from 1952 to 1956 for the Reds and Phillies. He had 482 hits, 69 home runs and a .269 batting average. He answered my questions as well when I asked him who the toughest pitcher he faced (Koufax) and that if there was anything about his career that he would go back and change (he would have learned to steal bases more). I mailed to Greengrass on April 18 and got the cards back on May 2, for a 14-day TAT. 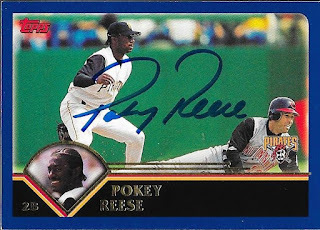 I was able to get several cards signed TTM from a player who retired more recently than most of the guys that I have sent to in Calvin "Pokey" Reese. 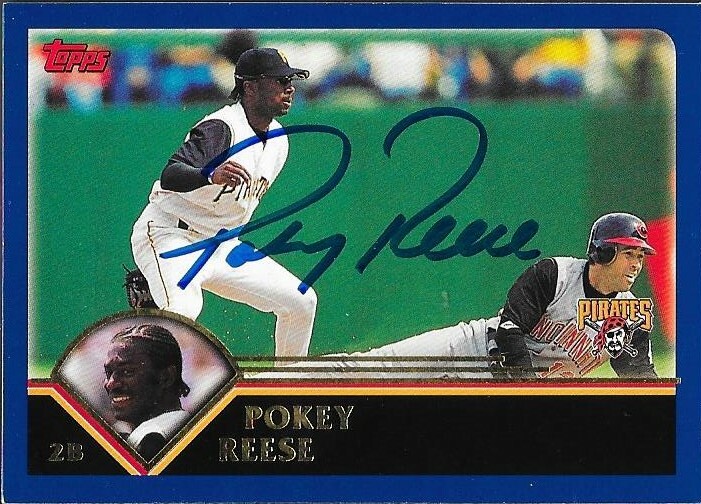 Reese has a really nice signature, as seen on the above 2003 Topps. Actually, this 2003 Topps might be one of the best looking cards I have gotten back TTM. It looks so awesome! Reese ended up signing 6 cards for me, some of which will help me with my Topps Autograph project, and two others that I just thought would look nice signed. 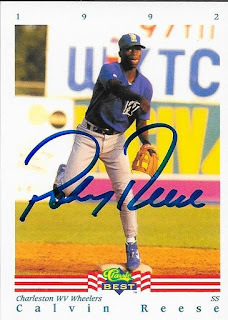 The above 1992 Classic Minors card was one that I have had forever, probably since 1992, and I just had to include it in the TTM request. It turned out really nice, and now I will have one of these in my album. I had Topps cards from three other years that Reese signed for me, but I was able to add from 1999, 2000 and 2002. I also had this 1998 Collectors Choice, and it turned out really great as well. Reese (b. 1973) played in the majors from 1997 to 2004 for the Reds, Pirates and Red Sox. Reese was also a member of the Colorado Rockies for a day when he was traded from the Reds to the Rockies then from the Rockies to the Red Sox. Two days after that, he was granted free agency, then signed with the Pirates. He had 704 hits, 44 home runs and an average of .248. He was a Gold Glove Award winner in 1999 and 2000 while with the Reds. He won a World Series in 2004 with the Red Sox. I mailed to Reese on March 28 and got the cards back on May 2, for a 35-day TAT. I got a few signed cards back from former player, John Castino. I had found some of his cards in the 80s stuff that I picked up from the Columbia antique shop. This 1981 Topps turned out really nice. As I have said before, this set is a really nice one, yet is underrated. These also turned out really nice and are, from left to right, 1983 and 1982 Topps. 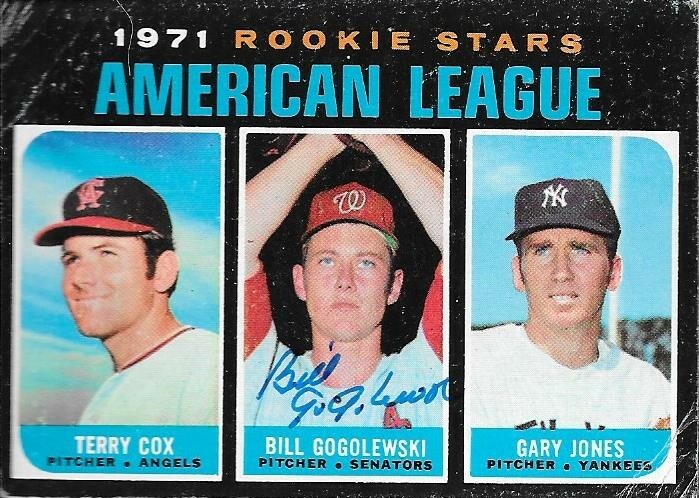 I like them as well, but the 1981 Topps turned out the best, I think. Castino (b. 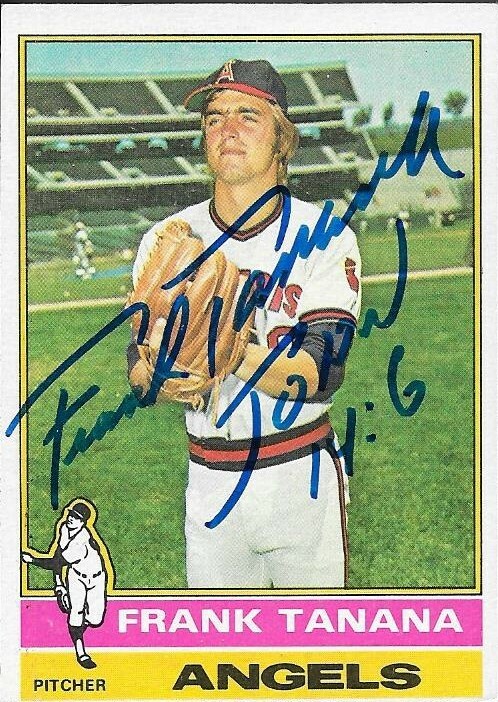 1954) played in the majors from 1979 to 1984 for the Twins. He had 646 hits, 41 home runs and a .278 batting average. He was the AL Rookie of the Year in 1979. 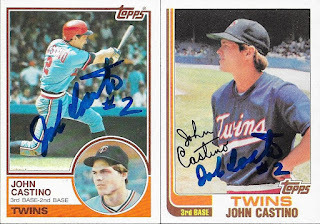 I mailed to Castino on April 21 and got the cards back on May 2, for an 11-day TAT. 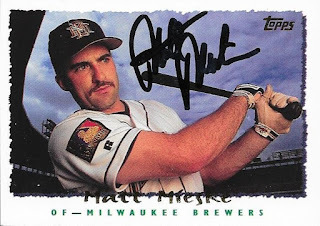 As I continue along in my Topps Autograph project, I have been able to knock out most of the years of Topps fairly easily. The toughest cards that I have been able to get signed are surprisingly the most recent. I don't get many opportunities to do any "graphing" so current players tend to be pretty tough. When I looked at my tally sheet of the years I still needed for my project, I realized that I would be able to knock off 2009 fairly easily. I had this extra 2009 Topps Koji Uehara card in my Orioles box and had recently seen my buddy Max get a quick return from Koji after sending to him at Spring Training. Unfortunately, Koji only is signing one card per request now, but that didn't bother me. I have already gotten Koji TTM on a baseball. I just was able to use this as a chance to add a cool card from a year I was having issues obtaining anyway. Up to today, Koji has a career record of 19-20 with an ERA of 2.48 with 86 saved and 476 strike outs. He was the World Series MVP in 2013 for the Red Sox. He won't make the Hall of Fame, but could very well come back to Baltimore in the future as part of the Orioles Alumni or something. I feel like he is still really popular in Baltimore. I mailed to Koji via Fenway Park on April 20 and got the card back on May 2, for a 12-day TAT. 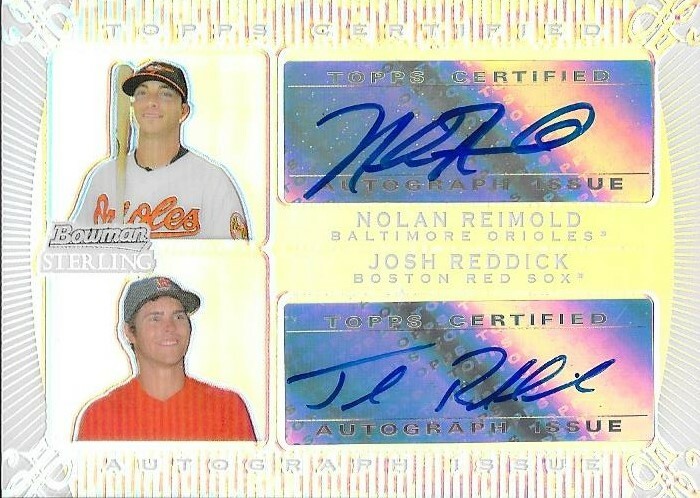 I finally sold the 2010 Topps Pro Debut Henry Ramos printing plate on my COMC account, so that afforded me the chance to try to get a deal on a 2009 Bowman Sterling Nolan Reimold gold refractor auto. I was able to make an offer, which the seller accepted, so now, I have this beauty. It is numbered 43/50. Believe me when I say, it looks so much better in person. I have been wanting one of these for a long time, and now I have one. I got it for a steal at $6.50. I had enough store credit for another card, plus the $3.00 flat rate shipping, so I picked up this 2005 UD Ultimate Brian Roberts numbered 41/50 for $2.74. I also got one of my friends a card as well, and then paid the $3 to have all of the cards shipped my way. I hadn't bought off of COMC in a while, and I haven't sent a shipment in for sale in a while either. My sales have significantly decreased on there, so I think it is about time I added some more inventory from some of the stuff I have been taking to card shows that isn't moving like I would have liked. COMC is a great tool, but you have to work to keep your inventory updated and your prices right. I still enjoy it, and have done well in finding nice parallels, like the cards shown above. 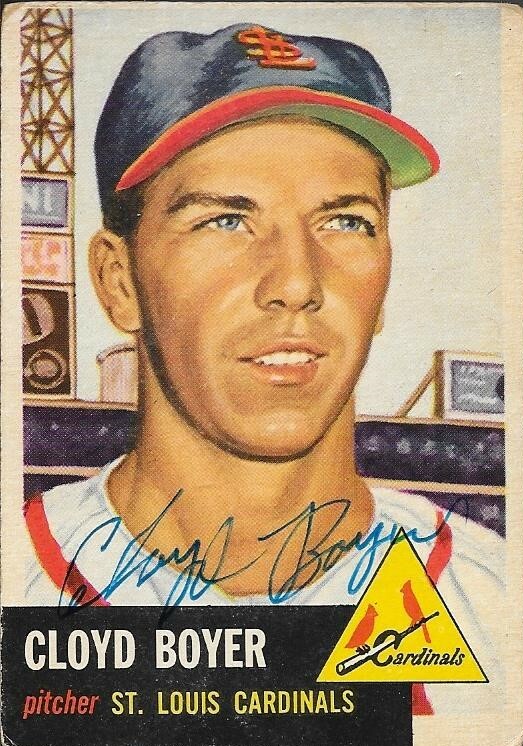 Here is another vintage TTM success in this 1953 Topps Cloyd Boyer. The card was rough when I sent it, but it really turned out great. I mailed to Boyer on April 18 and got the card back on May 2, for a 14-day TAT. I picked up the card from the Columbia antique shop, but it was the only Boyer I could find. Boyer (b. 1927) played in the majors from 1949 to 1952 and 1955 for the Cardinals and A's. He had a career record of 20-23 with an ERA of 4.73 and 198 strike outs. He is the brother of the late Clete and Ken Boyer. 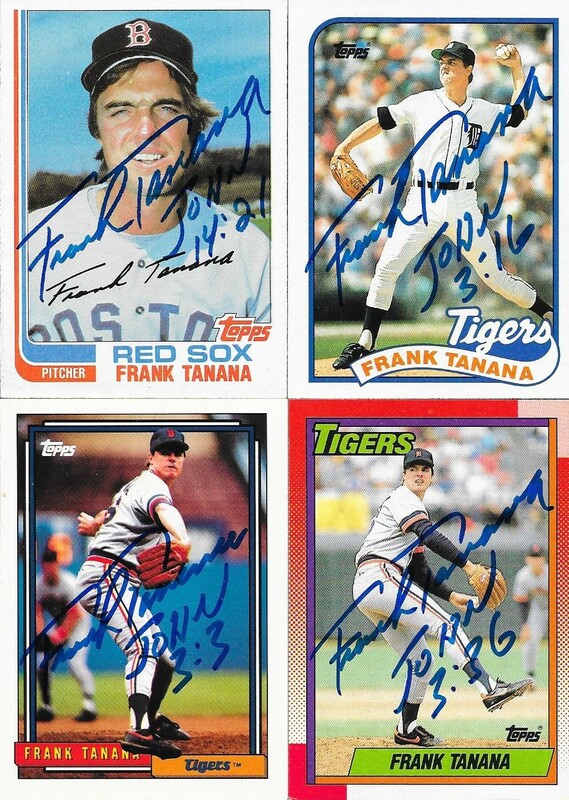 I received a nice TTM success from former pitcher, Frank Tanana. He was someone who I had a multitude of cards of, so choosing what to send to him was quite the task. I wanted to puff up some of the numbers of years that I didn't have a lot of, like this 1976 Topps. It was a nice card and the signature turned out great. I had some other years that still weren't very well represented in my Topps Autograph Project, so I sent off these as well. All of them look great, but the 1989 Topps might be the best of the bunch. The 1992 also looks good. I'm surprised that I have only 2 signed cards out of that set. I really need to send off some more. Tanana inscribed each card with a different bible verse, which was a nice touch. He also included this signed religious tract. Tanana has a really great signature, and I was glad to be able to add him to the project. Tanana (b. 1953) played in the majors from 1973 to 1993 for the Angels, Red Sox, Rangers, Tigers, Mets and Yankees. He had a career record of 240-236 with an ERA of 3.66 and 2,773 strike outs. He finished as high as third in the AL Cy Young voting (1976) and was an All Star three times (1976, 1977 and 1978). He appeared on the 1999 Hall of Fame ballot, but did not receive a vote. 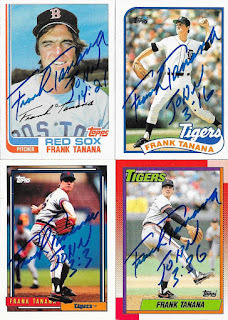 I mailed to Tanana on April 23 and got the cards back on May 2 for a 9-day TAT. I'm working on catching up on a lot of posts. So much so, I haven't sent off too many TTMs lately so I can get some other stuff posted. I had something I had gotten from my buddy, Dugan, at the last card show that I wanted to post. 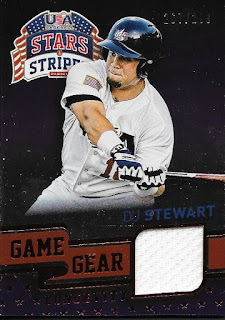 He gave me this DJ Stewart relic from Stars and Stripes baseball that I really liked. Stewart hasn't done nearly as well as I had liked, but I am hoping he picks it up and can contribute to the O's in the future. Regardless of how Stewart is doing, I really appreciate Dugan thinking of me and hooking me up with this card. Dugan is a great guy and I'm happy that we have been able to meet up at shows. I added another player to my TTM success list when I got a few cards in from former pitcher, Bill Gogolewski. 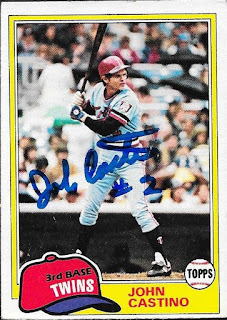 One of the best "names" I have gotten so far, I was able to get his 1971 Topps rookie card signed. I was also able to get a 1975 SSPC and a 1974 Topps signed as well. The SSPC came from my buddy, Max, and I got the 71 and 74 from my local card shop. Gogolewski (b. 1947) played in the majors from 1970 to 1975 for the Senators, Rangers, Indians and White Sox. He had a record of 15-24 with a 4.02 ERA and 301 strike outs. 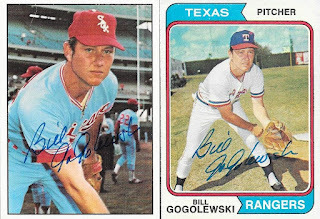 I mailed to Gogolewski on April 23 and got the cards back on April 30 for a 7-day TAT. 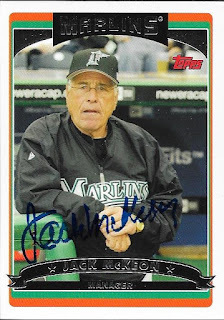 I was able to add a really nice TTM success fairly quickly from former manager, Jack McKeon. He lives in NC, so my request got to him pretty quickly. I got the cards back 10 days after I sent them and was pretty happy with the results. 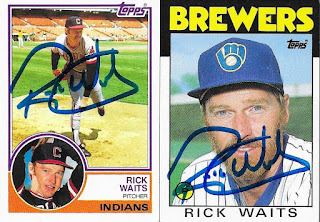 I have now added a few of these team cards with manager's signatures to my project. They're a good way to get some managers who otherwise wouldn't have any cards, or they have cards in older sets that carry more of a premium. 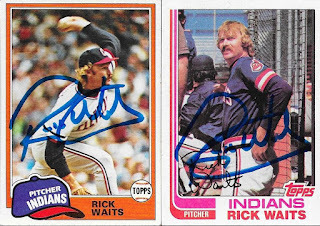 I bought an assortment of 1970s cards from the Columbia antique shop and was able to use some of them in my TTM requests. I bought them in bulk, so I got a great deal! I was also able to find in one of my dime boxes, this 2006 McKeon. I have very little 2006 remaining, since my box of extras tipped over when I moved. The box fell out of the truck when I opened the door, and all of the cards spilled out into the curbside drain. I wasn't too happy with that. Luckily, I have still been able to find some of them, and have now gotten a few signed. This one turned out nice, except the over-gloss caused the auto to bubble up a bit. McKeon (b. 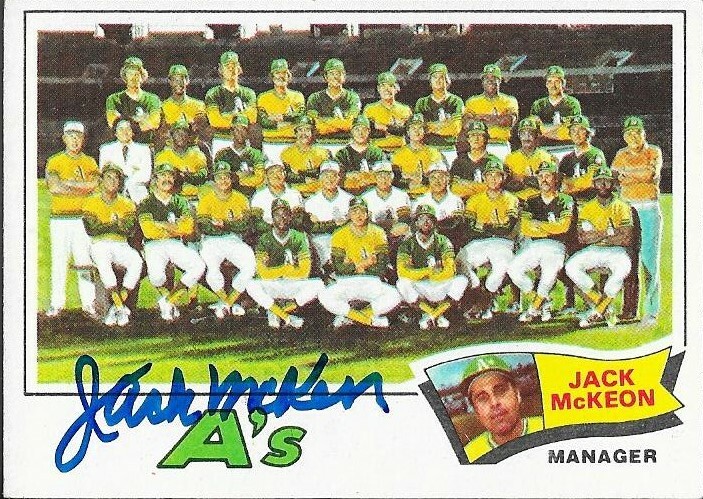 1930) managed from 1973 to 1975 with the Royals, twice for the A's between 1977 and 1978, for the Padres from 1988 to 1990, for the Reds from 1997 to 2000 and the Marlins from 2003 to 2005 and part of 2011. He is best known for guiding the Marlins to the World Series Championship over the Yankees in 2003. He had a career record of 1,051-990 for a winning percentage of .515. I mailed to him on April 20 and got the cards back on April 30 for a 10-day TAT. I have been talking to my friend, Zach every day since our first deal. He is a really great guy and has been a lot of fun to talk to. 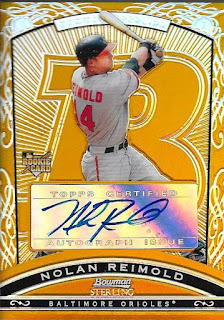 He surprised me last week with a care package that had this 2009 Bowman Sterling dual auto refractor for my Reimold PC. 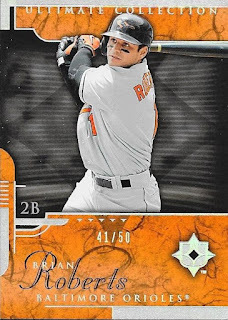 I had the base version already, but not the refractor. 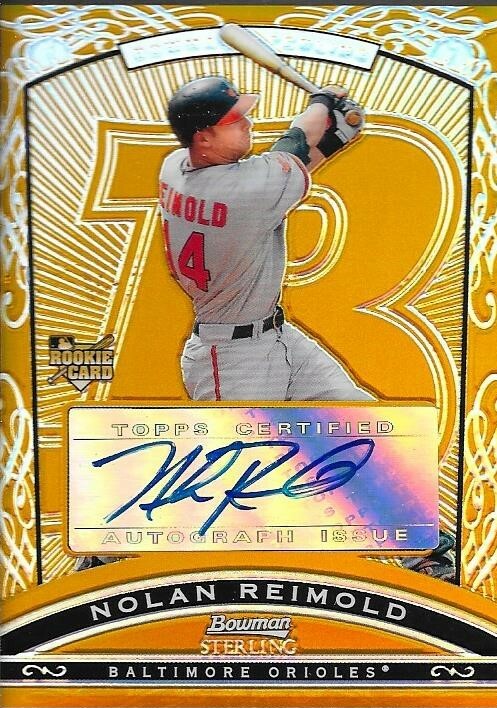 This card is numbered 119/199 and looks awesome. It is already in a magnetic case and team bag. I was amazed at Zach's generosity when I got this card. It didn't take a nice card for me to know he was a great guy, though. He has gone out of his way to be a friend, which I definitely appreciate. Thank you so much for the card, Zach! I really appreciate it, but more importantly, thank you for the friendship! Some of the best cards to get signed are 1954 Topps, in my opinion. The above Bob Oldis turned out really great. I bought it because of the color, and I liked the glove shown on the card. I have a decent collection of older gloves that my mom has picked up for me, and I always accept others. I just like how they look. 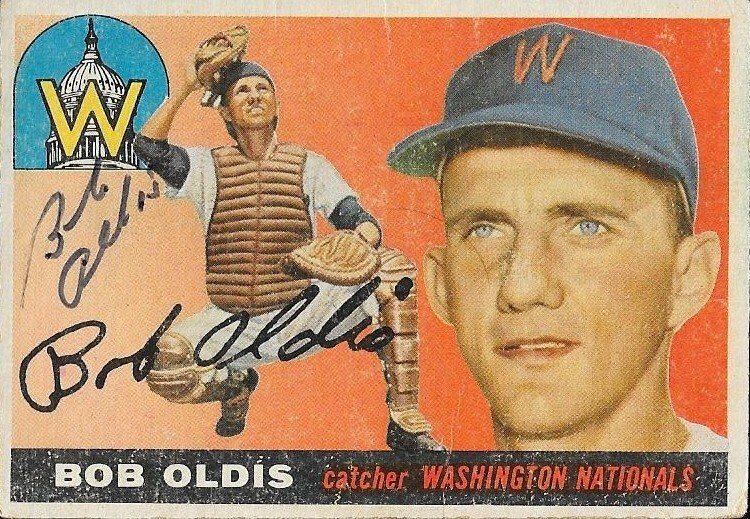 Oldis's signature is quite modest, but fits nicely on the card. It doesn't take away anything else from the card and will look really good in my album. I also had to get this 1955 Topps because it featured Oldis in full catcher's gear (at least, it's supposed to be him, or an artist's rendering). I like the "old school" gear and also the old Washington Senators logo and hat. Oldis (b.1928) played in the majors from 1953 to 1955 and 1960 to 1963 for the Senators, Pirates and Phillies. He had 56 hits, 1 home run and .237 batting average. 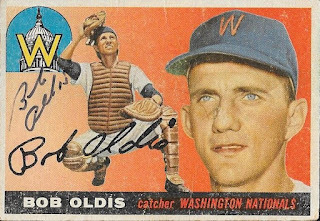 Oldis appeared in two games during the 1960 World Series, but didn't register a plate appearance. No matter, the Pirates won that Series and Mr. Oldis has a ring to show for it. I mailed to him on April 18 and got the cards back on April 30 for a 12-day TAT. Still, the 1950s cards keep on coming up in my "to be blogged" pile. This time is a series of cards that I got back from Joe DeMaestri on April 29. 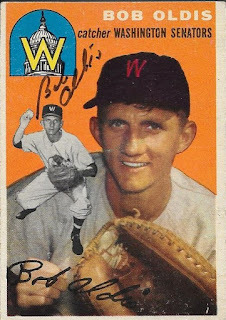 Another signed 1956 Topps made the cut and it turned out really nice. 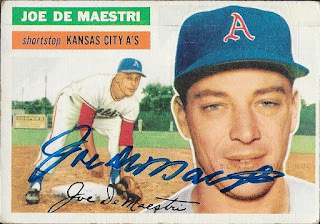 The card does a good job showing the old Kansas City A's hat and uniform, which I enjoyed. The background of the card is really nice, as well. I hadn't really paid attention to the backgrounds of these cards until recently, and they really help the cards in a subtle way. 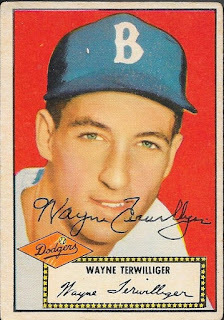 Here's a nice 1957 Topps that turned out pretty well. 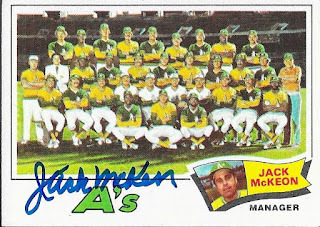 Another good shot of the old A's uniform is shown, which was one of the purposes of looking for the signed Topps cards and trying to add some of the "now defunct" teams. Finally, here is a 1959. 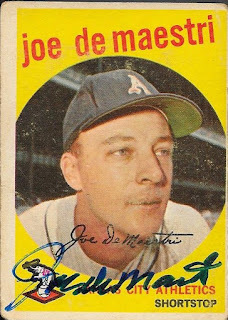 It turned out ok; it looks like DeMaestri's marker failed a bit in the J in Joe, but in all, the card looks good and I am happy. DeMaestri (b. 1928) played in the majors from 1951 to 1961 for the White Sox, Browns, A's (both Philadelphia and KC) and Yankees. He had 813 hits, 49 home runs and an average of .236. 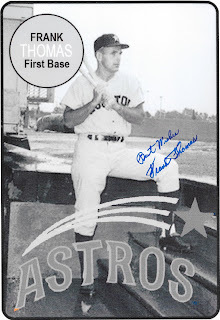 He made the AL All Star team in 1957. I mailed to DeMaestri on April 18 and got the cards back on April 29, for an 11-day TAT.